I was followed the other day by a new author. He isn't published yet, but through his Twitter and blog he is chronicling his journey. In the first line of one of his posts he says, "Up to this point, I've written about my topics generically. After a few tries, I think I can conclude that what I've written to date isn't what blogging is all about." However, he never goes on to define what blogging is all about! A woman left a rather snarky comment: "Is the purpose of your blog really just to share thoughts on how to be successful as a writer? There's already a plethora of blogs out there filling that niche -- maybe do some research to see where you could add something unique? But if the real purpose of the blog is to cultivate readers interested in your writing you might want to just share excerpts and hold off on writerly advice till the book is actually published. My $0.02." While in many ways I agree with her comment in relation to this particular blog, it got me thinking about my own blog. Does it need a purpose? Am I doing something horribly wrong? Example: Typically updated daily, blogs often reflect the personality of the author. So if this is the definition of a blog, in a general sense, why should I even consider that there is something wrong with my blog? Why does a blog need to be only focused on ONE thing? I don't think it does! My blog is a perfect representation of the dictionary definition of a blog: an online diary, a personal chronological log of thoughts published on a Web page. Sure, I lean towards blogging about some main subjects in particular; however, I love my blog just as it is. It is an outlet for me to rant my thoughts and feelings on a variety of subjects that I am passionate about. I have been blogging about everything and nothing for over 4 years and I love that I am able to go back and relive great moments, cry over the sad ones but most importantly I have found that I have stayed true to myself in my writing. My life isn't about just one particular subject, it is a tapestry of many which is what my blog is a reflection of. I'm not looking to be published. I don't pass myself off as a writer. I wouldn't even care if I made a penny or a thousand dollars from my blog. I would love to have more followers, not for bragging rights but as an opportunity to have conversations with a variety of interesting people. 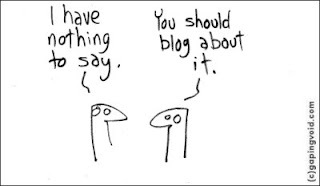 What is your definition of a blog? Back on the Wagon... Again.